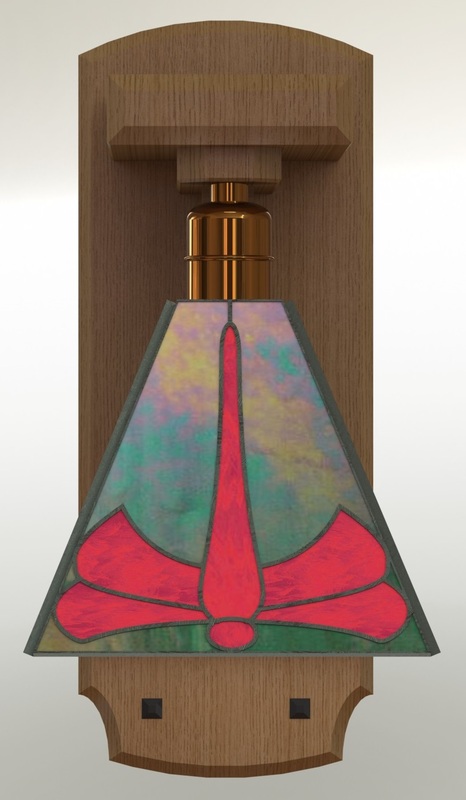 Perhaps a month or so ago I finished a pair of mission-themed sconces in quarter sawn white oak with stained glass shades. There was one significant problem with them, there was no wiring in the wall where I wanted the hang them. That meant cracking open the drywall, running wires, patching drywall, matching texture… Not something I was eager to sign up for. Enter “Reliable Rick”. He’s a handyman that we’ve had do a number of jobs around the house, and this was right up his alley. 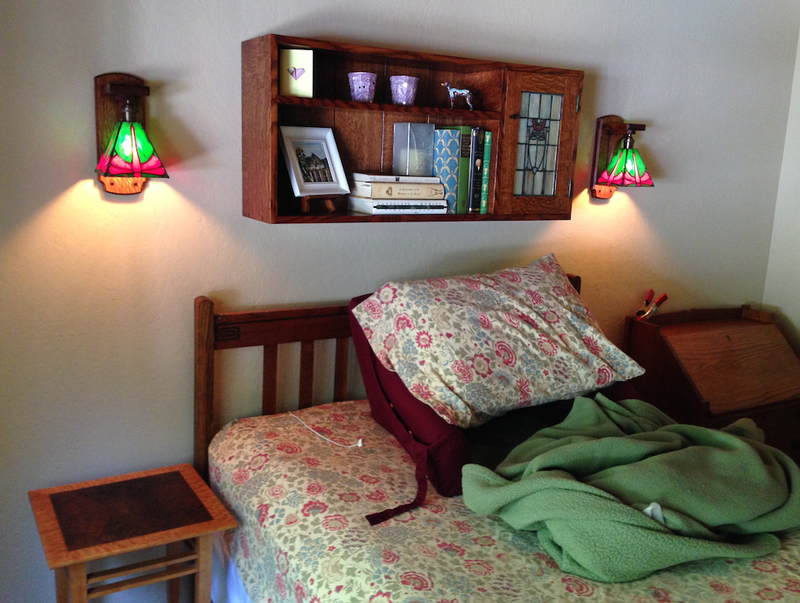 Rick cut a couple of surgical openings in the wall, ran a new circuit from the light switch to the wall where we wanted the sconces hung and took care of all of the necessary details. 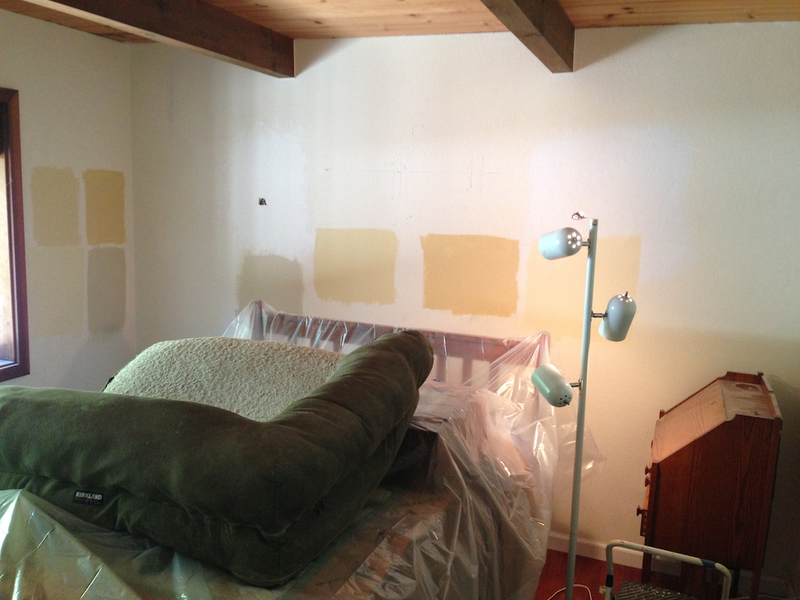 Walls after patching – the big squares are color samples we were trying out. The final choice was the grey on the left. We ended up painting the room, replacing the switch covers with nice mission style brass versions and got everything finished and put back together just a few minutes ago. As part of the room re-do we lowered the “Byrdcliffish” cabinet I built recently, the sconces are mounted on either side of the cabinet. They don’t provide a lot of light, they were more intended to provide some color and warmth.. 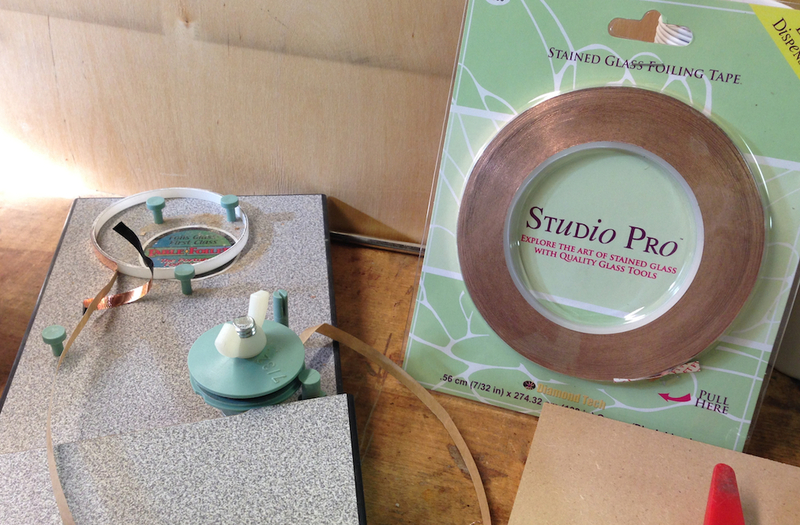 The copper foil tape I needed to finish the stained glass shades for my Arts & Crafts sconces came, and I took today off work to play in the shop (and clear my head of work nonsense). 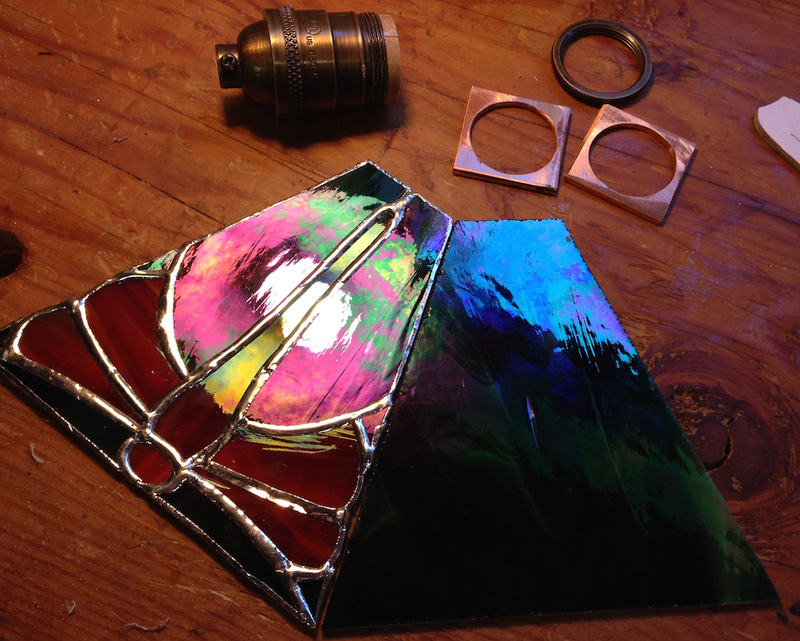 I’m pretty close to having the sconces done, but I was so eager to see if it was all going to fit together and work out that I took one stained glass shade through to completion so I could test assemble a sconce. I’ll give away the ending, it all fits OK. There are a couple of details I may want to tweak in the design, but nothing major. 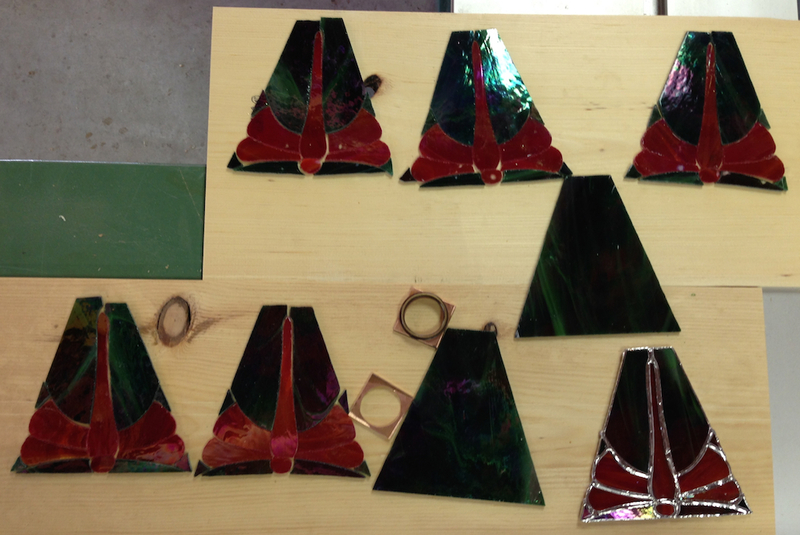 Soldering the four panes and the copper piece to fit the lamp socket was a learning experience. My first one came out s0-so, I think the next will be better. 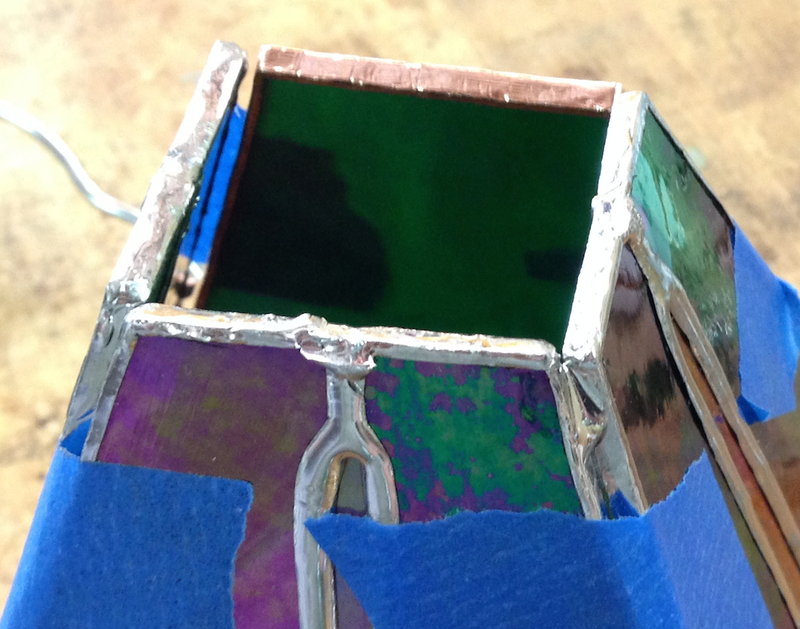 Soldering an unsupported seam with gaps is a little tricky. I used blue tape to roughly position the parts in place, then tack-soldered one joint at a time, tweaking it to get the best alignment I could. Once all four parts were tack soldered I fit in the copper adapter and soldered it in place, then I soldered the seams. Once it was all soldered it was the usual drill of washing the flux off, applying a black patina (a chemical that turns the solder black) then washing again, and finally using a special polish/wax to finish it off. 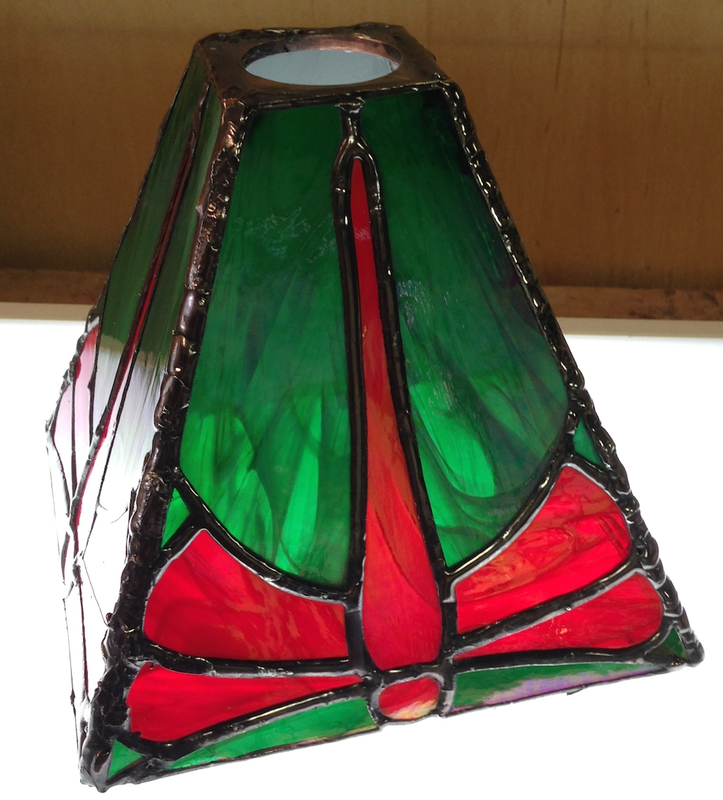 I thought I’d have finished these dragonfly sconces last weekend. I was sure I’d finish them this weekend. I just had to cut and grind the parts for four panels. 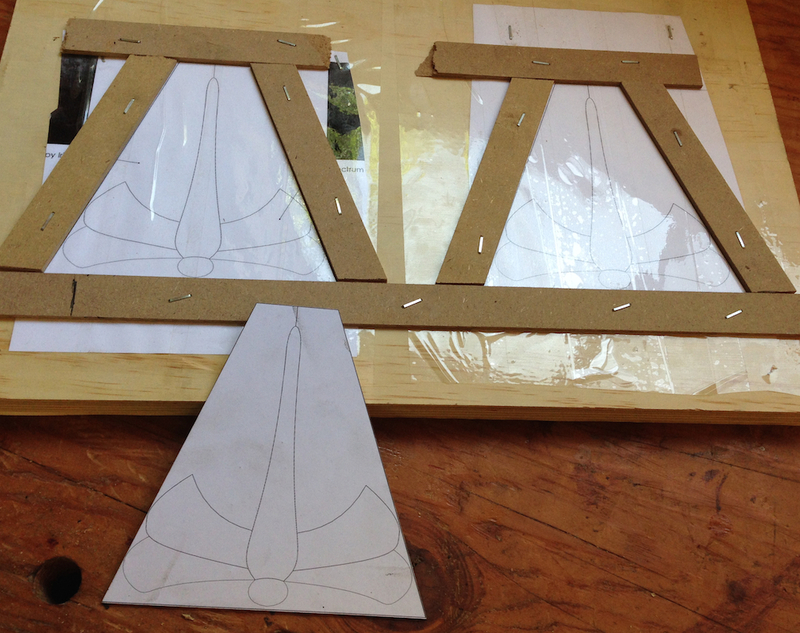 I had patterns made, frames to hold the parts for fit-up and had made one complete panel to make sure everything was going to work OK. Yesterday I was positive I would be posting finished pictures today. I got all of the parts cut and ground, I just had to foil them and solder everything. 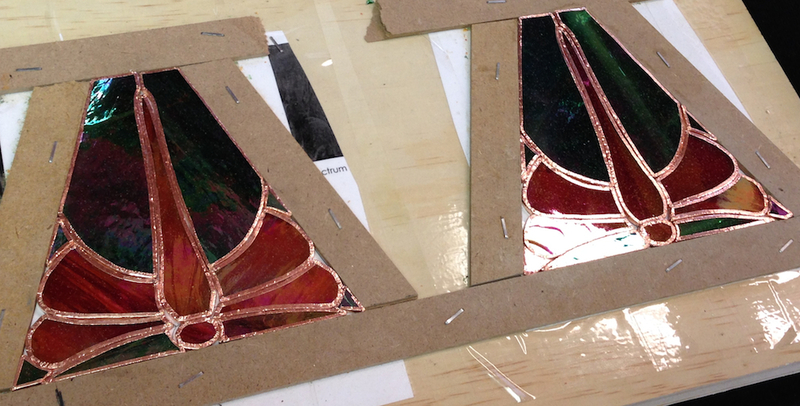 Unfortunately I ran out of copper foil. I was POSITIVE I have more of it on hand. but after looking everywhere, there is none to be had. 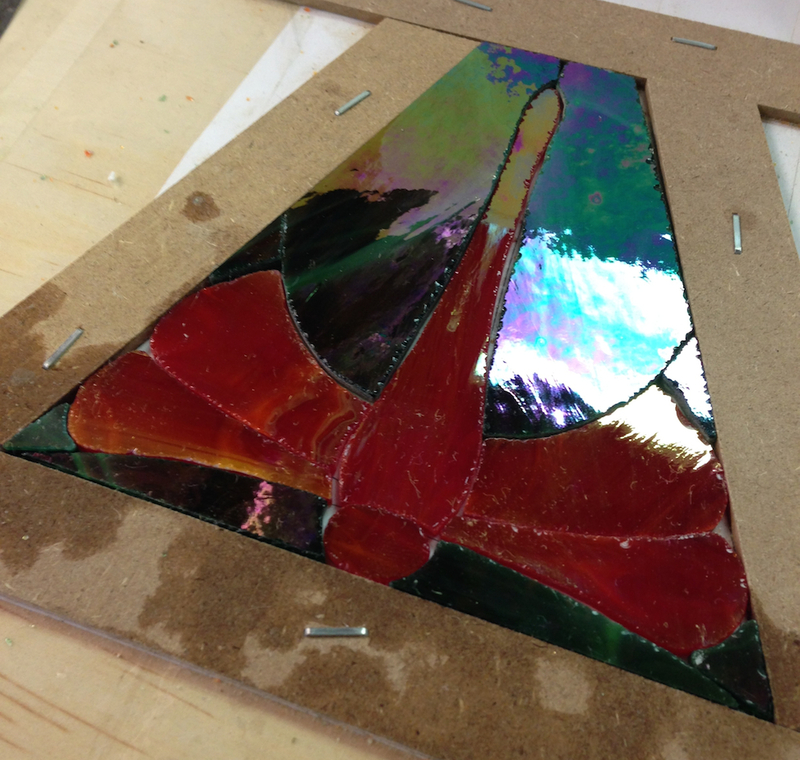 The local stained glass supply place is closed today, so I had to order some online. So it’s the middle of the afternoon on a Sunday, and I’m –>this<– close to finishing a project, but can’t. Rats. 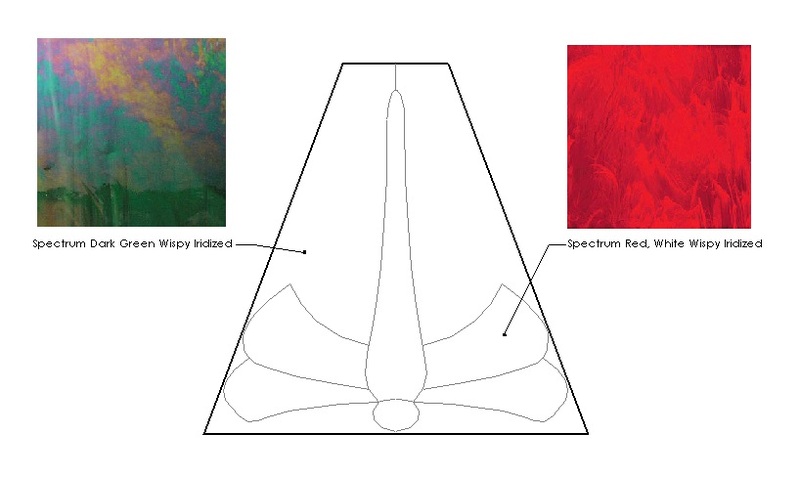 Two of the panels. 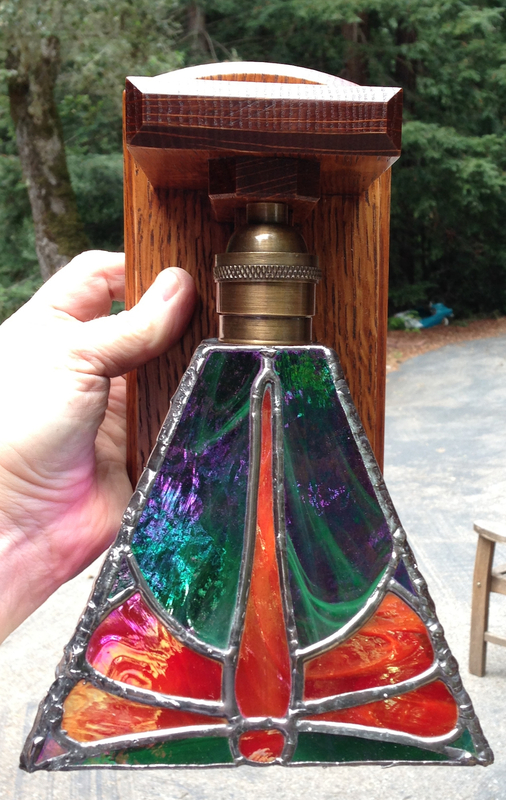 I’ll buck the best two out of all of the panels for the front face of each sconce. I’m using a solid piece of the same green for the back panel as it won’t show. I’m not sure what to do now. I guess I can start designing whatever I’m going to make next. Maybe I should do the gate as my next project? 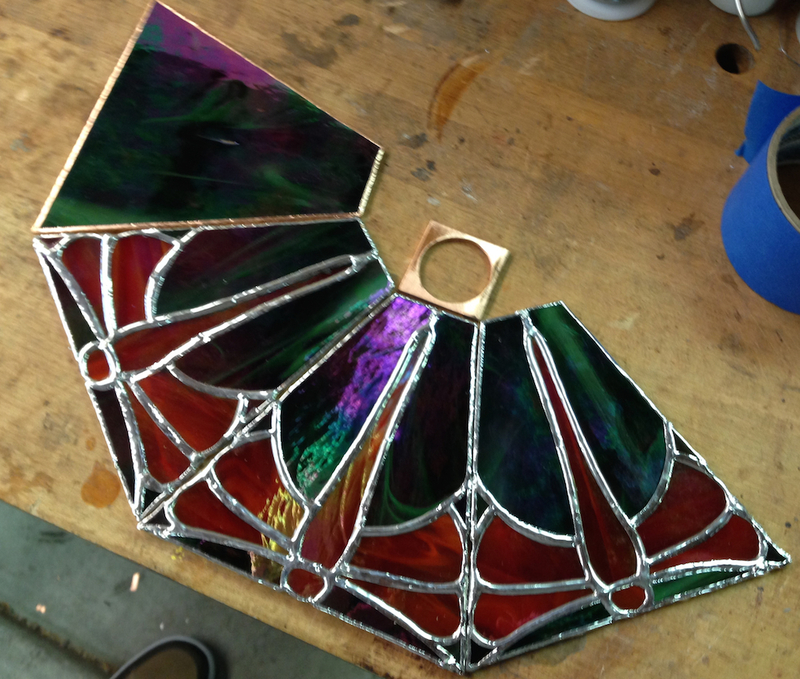 I got a couple more hours in the shop today, working on the stained glass panels for the Dragonfly sconces. 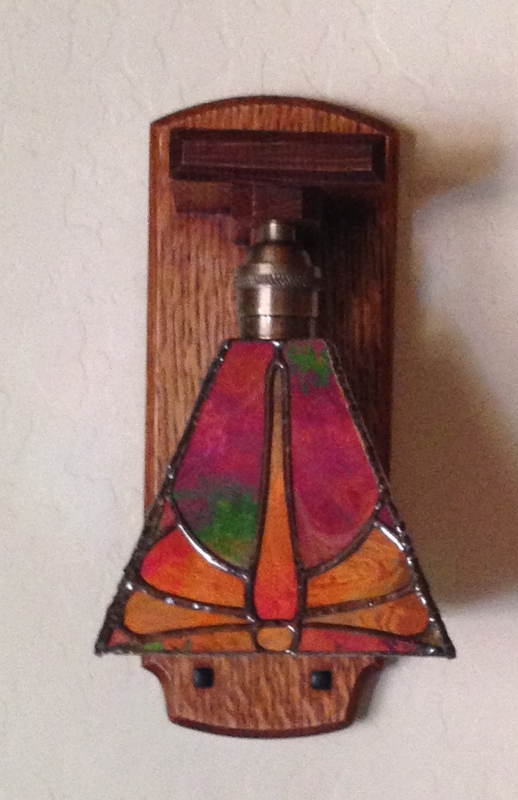 Things went pretty smoothly today, and I’m close to having one of the sconce shades done. The way my week works is that I’m totally busy with work and family until Saturday, and frankly it takes me a day or two to decompress from work and get in the groove in the shop…at which point it’s Sunday night and time to get organized for work. I’m feeling a vacation coming on. 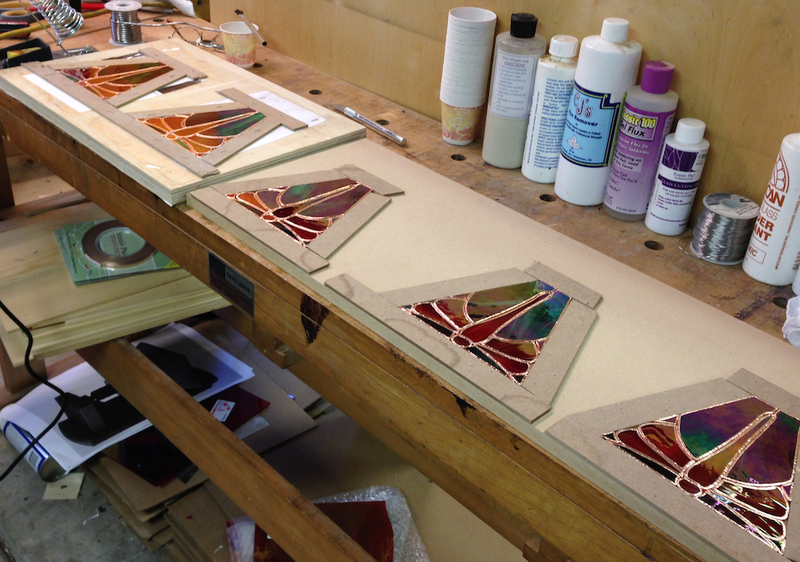 My goal for today was to get as much done on the stained glass shades for the sconces as I could. I’d like to finish these up next weekend (well, I’d rather have finished them up this weekend, but that wasn’t in the cards). My other goal for toady was to “get in the groove”, and I was able to focus much better today and as a result the parts came out nicer. 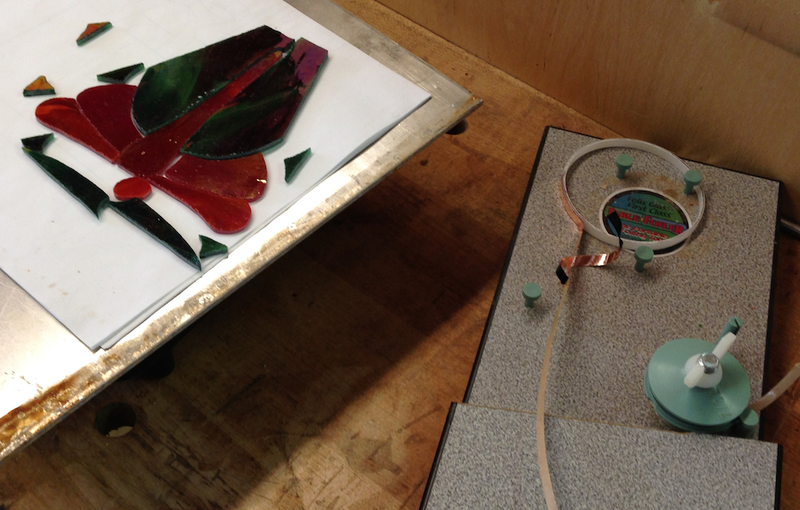 My process today was mark out the parts on the glass. Score them to separate them from each other, then score them as close to the final dimension as I was comfortable with. 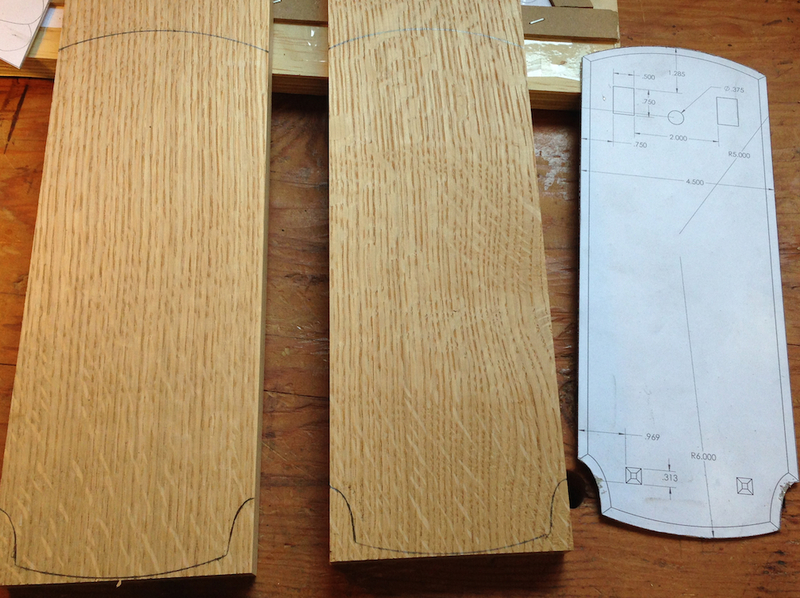 Once I had all of the parts for one panel scored and cut I moved over to the grinder and dialed in the shape. 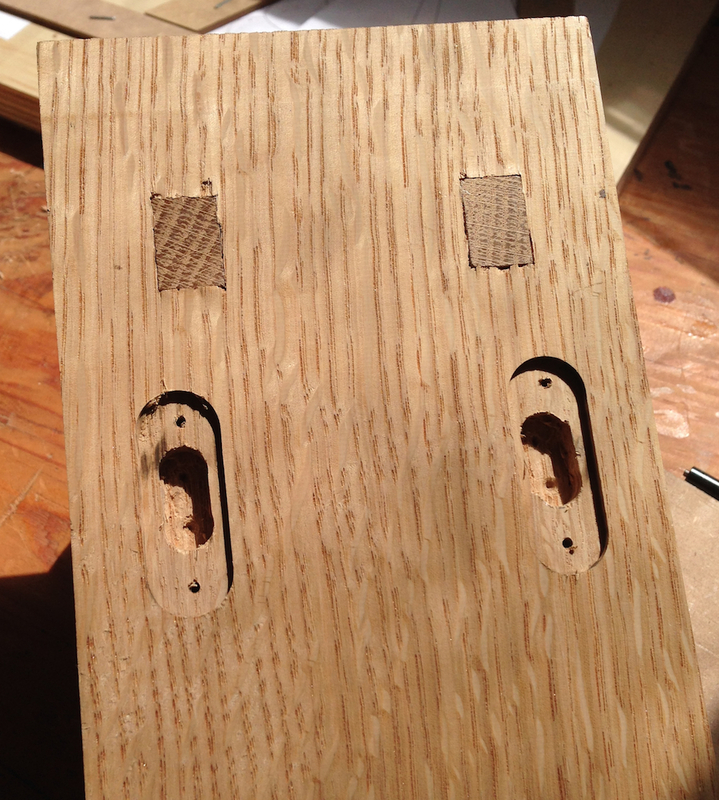 I got a much better fit on the first panel today than the one yesterday, and the second panel I made was even better. These pics are of the first panel, by the time I was on to the second one I was in the groove and couldn’t be bothered taking pictures. I didn’t go get a fine point sharpie, I just didn’t want to drive down to town so I decided to make the one I had work. 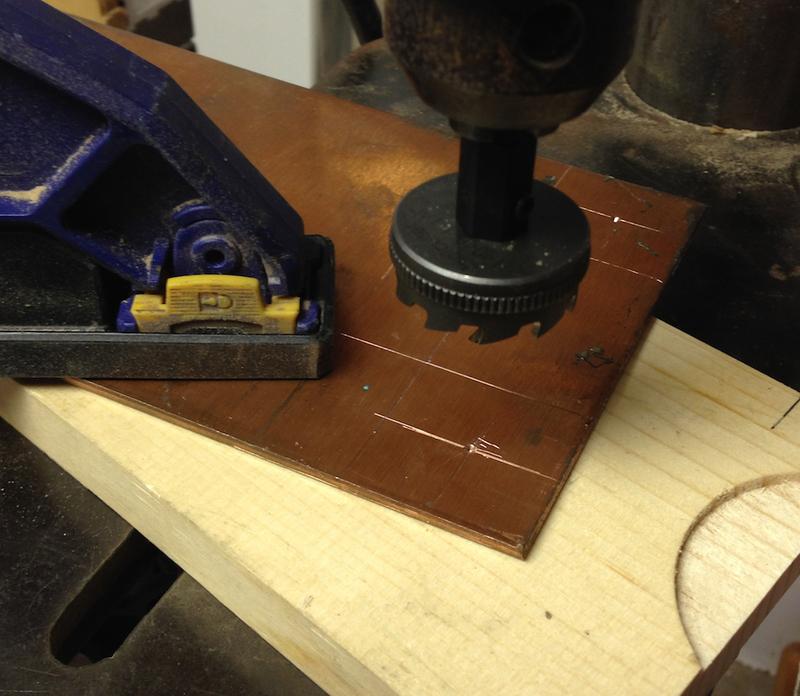 The layout looks sloppy as a result, but I only use that for the scoring and rough grinding. After that I’m fitting it into the pattern board and slowly sneaking up on the pattern. Trace around the patterns with a sharpie. The scoring goes pretty quickly, just a few minutes. The grinding takes a lot of time. 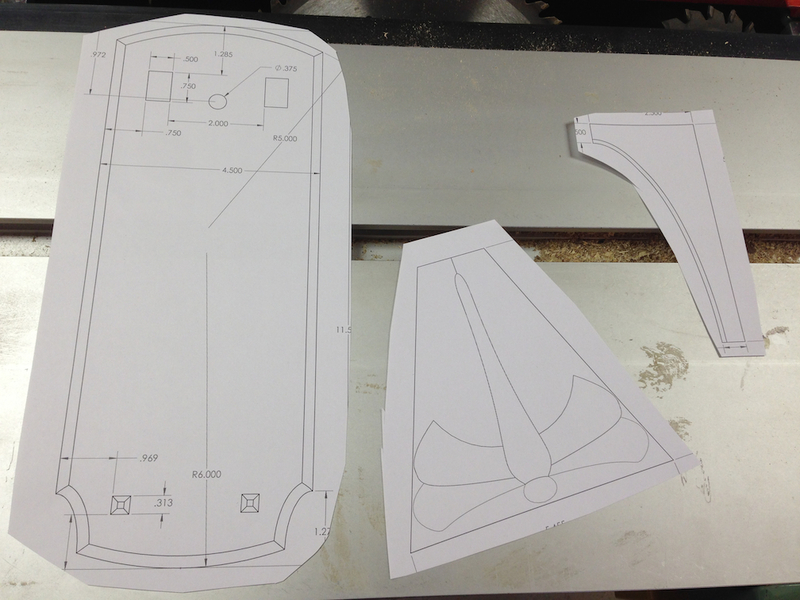 Grind a little, wipe off the sludge, check the fit, grind a little more… Eventually the parts will all fit nicely. There are a couple of gaps on this one that I wish were a little smaller, but it’s plenty good. 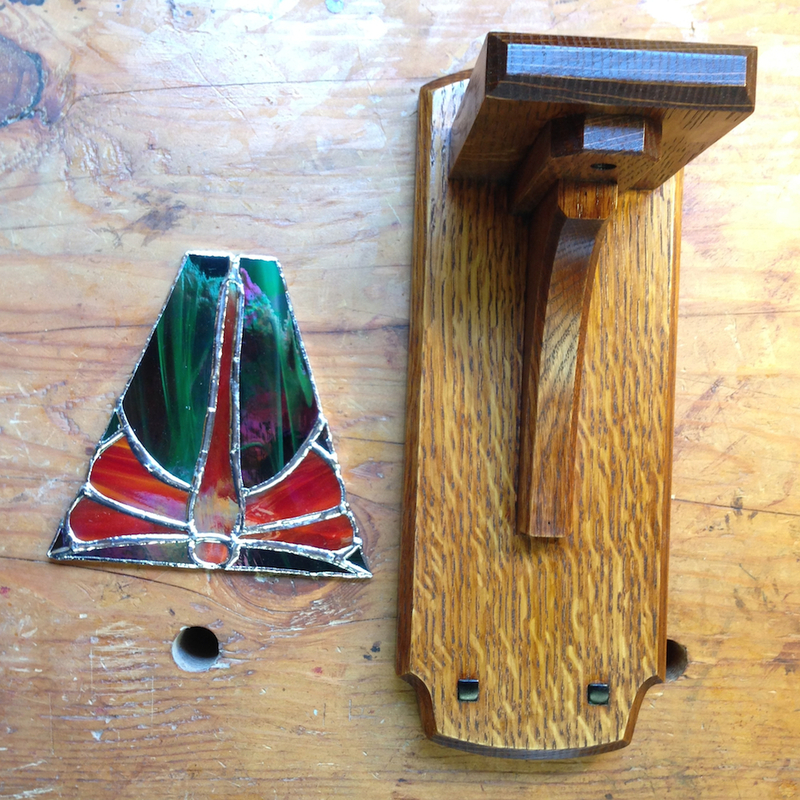 I also made the copper parts that will attach the stained glass shade to the lamp socket. The lamp sockets I got are really nice, cast brass with threaded shells. They are heavy and substantial, not like the stamped parts from the local big box store. I got these from Grand Brass for $10 each and I’m really pleased with their quality and service. To make the attachment plate I used 1/8″ copper sheet and drilled them with a Rota-Broach — it’s basically a fancy hole saw that makes accurate, burr free holes. 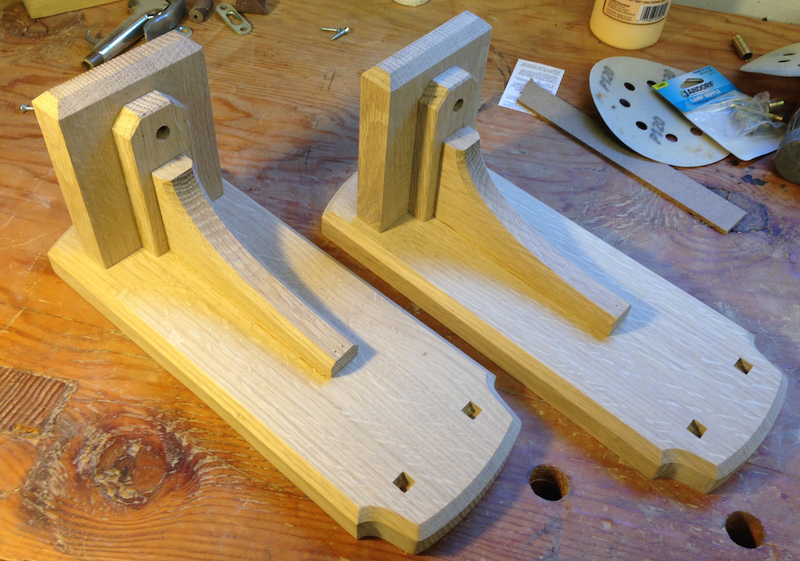 I had to use a sanding drum to sneak up on the final dimension as there isn’t a lot of shoulder on these sockets. 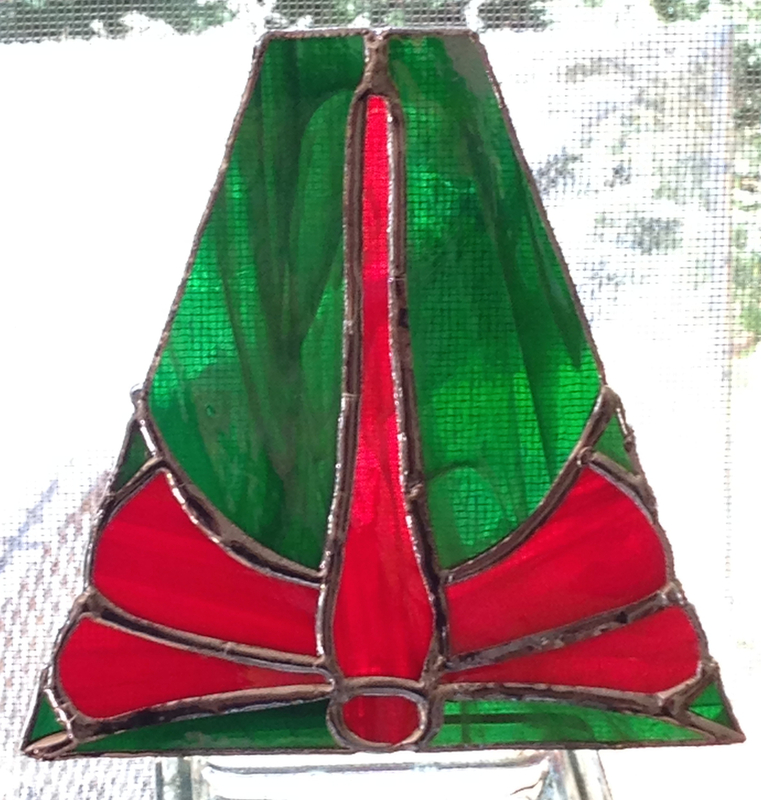 I decided that I’m going to use a piece of plain glass (the same green art glass) for the back as you won’t be able to see if there is a pattern on the back. So only three more panels to do next weekend. 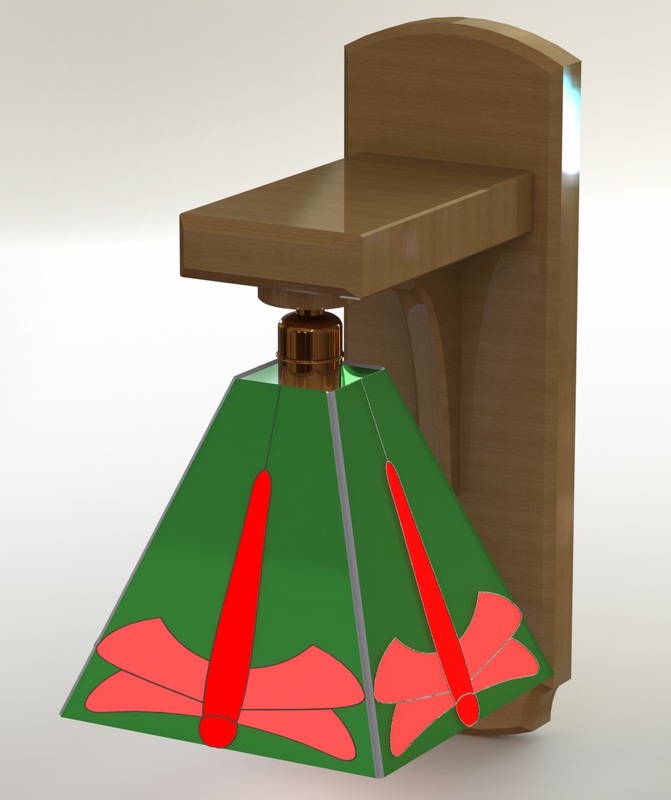 I’m going to make some sort of simple wood fixture to hold the parts in alignment for the final soldering. I’m a little concerned about getting the threaded ring in place when I’m installing it s there won’t be much finger room inside of the shade. I’m thinking of drilling two tiny holes in the threaded ring and making a little spanner to be able to turn it. We’ll see how things look at that stage. My friend Fay always says “you start with insufficient information and problem solve along the way”. It’s “one of those days” where I’m moving slowly in the shop. I got the finish applied to the wood bodies, and I started on the glass panels for the shades, but I was struggling with it a bit. My focus is off, and I wasn’t getting as nice a fit on the parts as I wanted. I went ahead and finished the one panel, but it didn’t feel quite right. First the wood. I used the same finishing approach as I used on the cabinet I just finished. 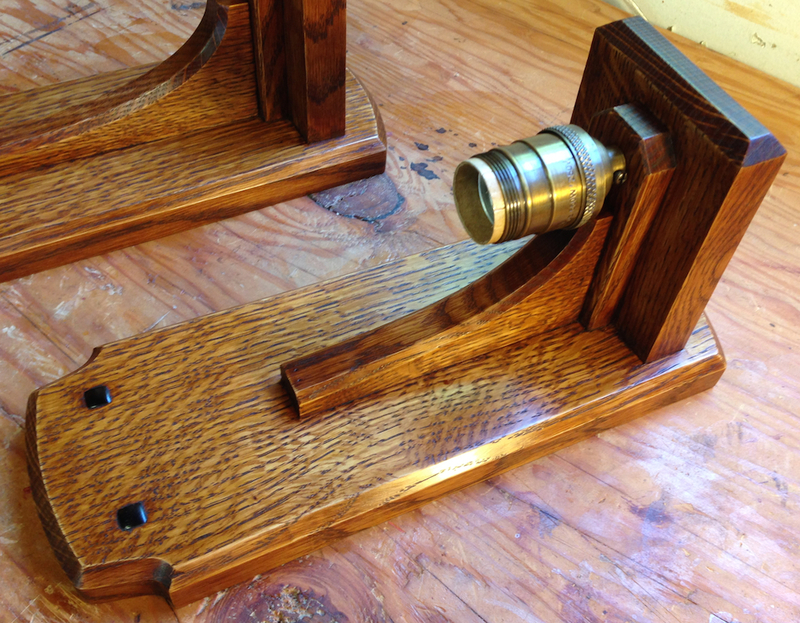 Dye, stain, Oil, shellac, brown wax. 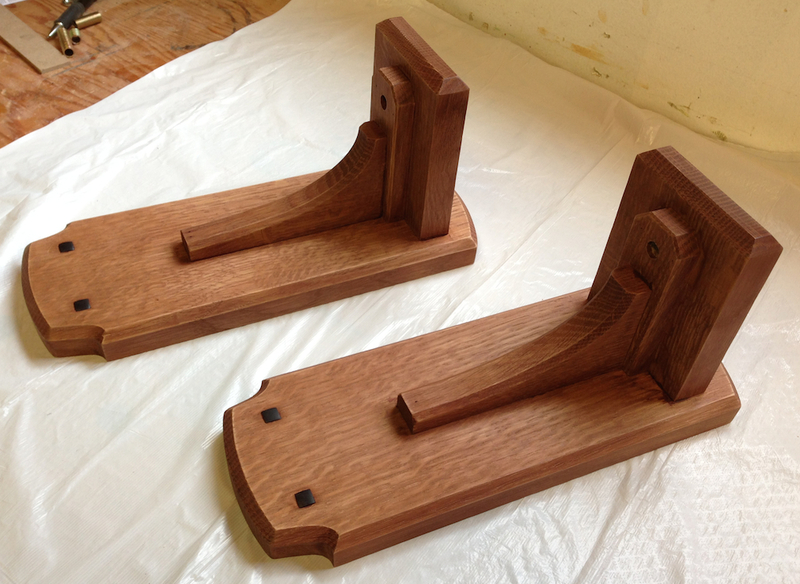 I’m pleased with the finish, the differences in the steps don’t show as clearly in pictures as it does in person. 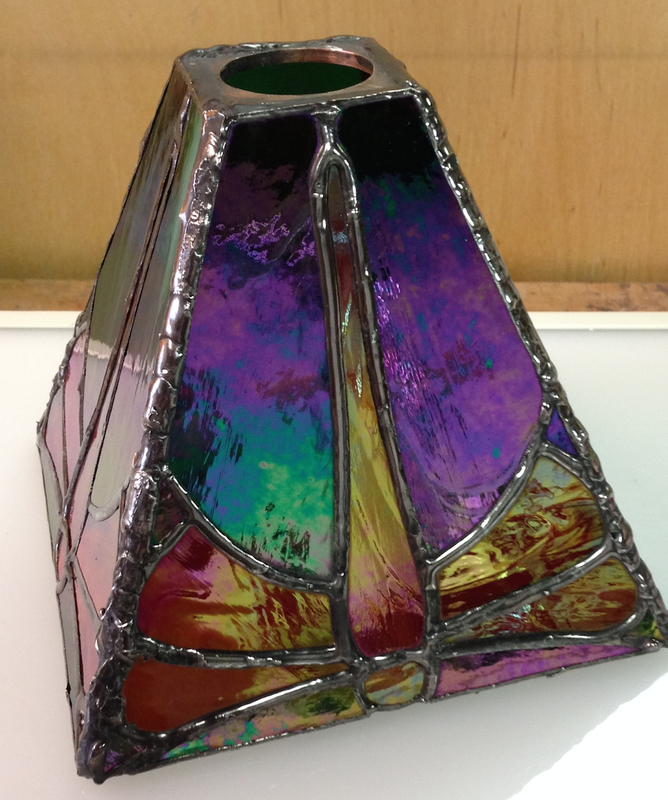 The final result is silky smooth, has a nice luster without too much gloss and a deep rich color. 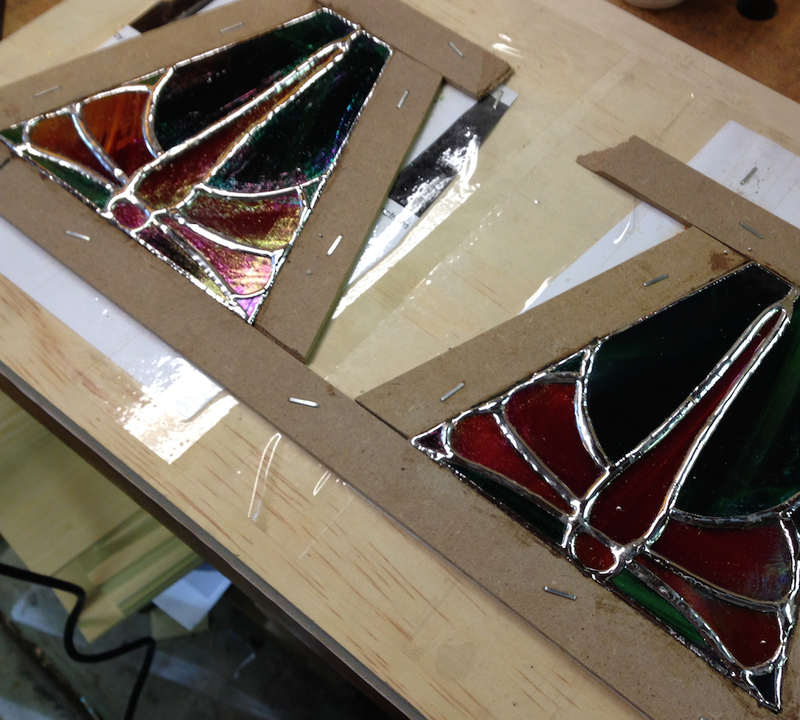 For the shades I’m making stained glass panels, four for each sconce. 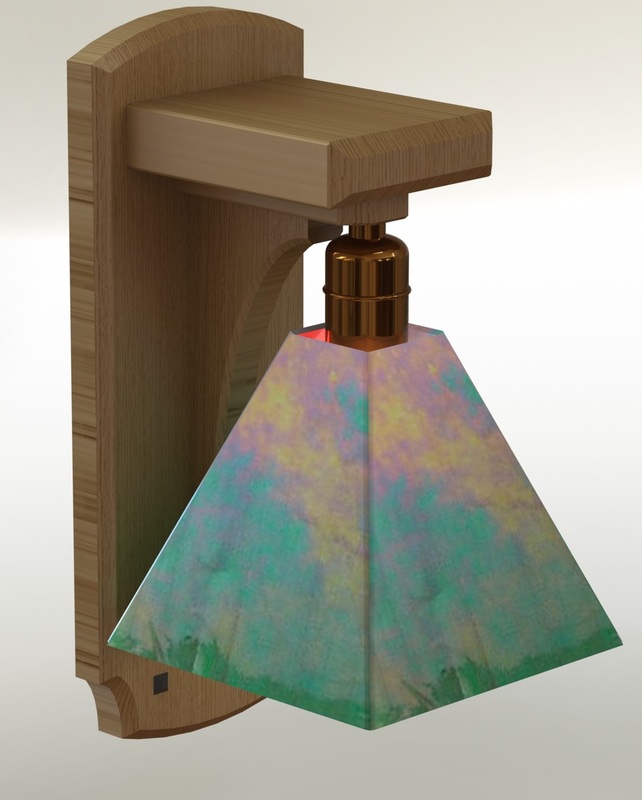 They will be soldered along the edges and a piece of copper soldered to the top, bored to 1.25″ to fit over the lamp socket. 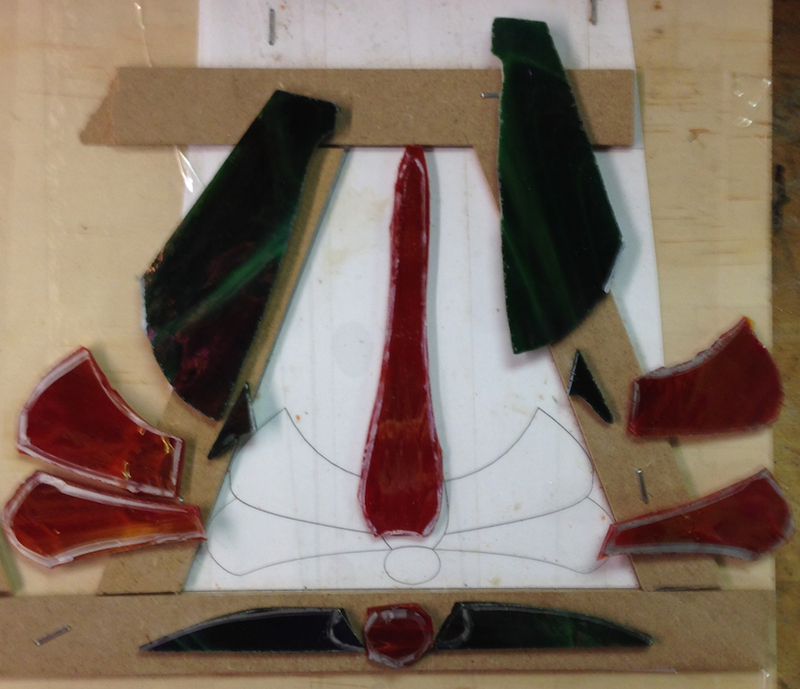 That ends up being eight stained glass panels, with a dozen or so small parts in each. I’m feeling a little intimidated by this part. I tried making the pieces as I drew them, but the sharp inside corner in the large green pieces was beyond my skill with a scoring wheel and nippers. I modified the pattern slightly to make it in more pieces, but I just wasn’t working to the level of accuracy I wanted. I tried making patterns for all of the individual parts, and that helped. I need to get a finer pointed sharpie though. 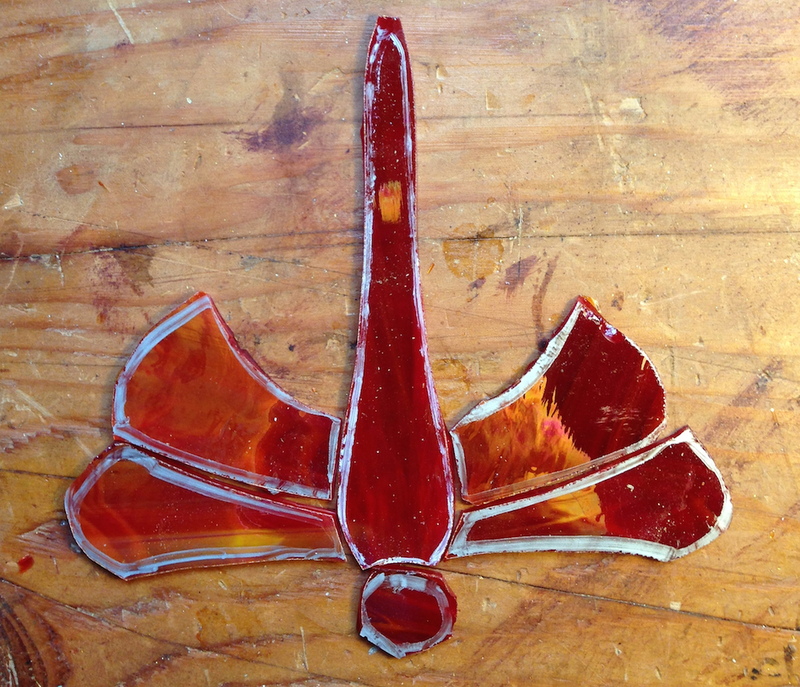 Here I marked and cut out the first dragonfly. 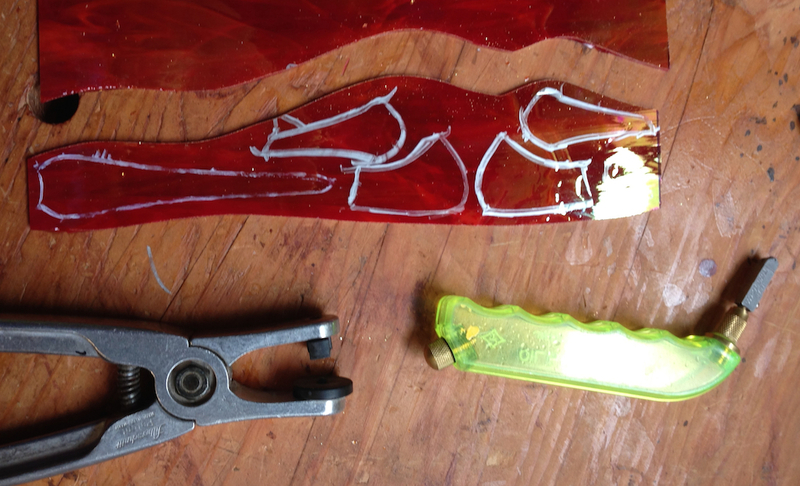 The cuts aren’t the final edges, from here I go to the glass grinder and smooth out the edges. That’s where I was having the most trouble — I was in too much of a hurry and was over-grinding the parts instead of sneaking up on just the right contour. 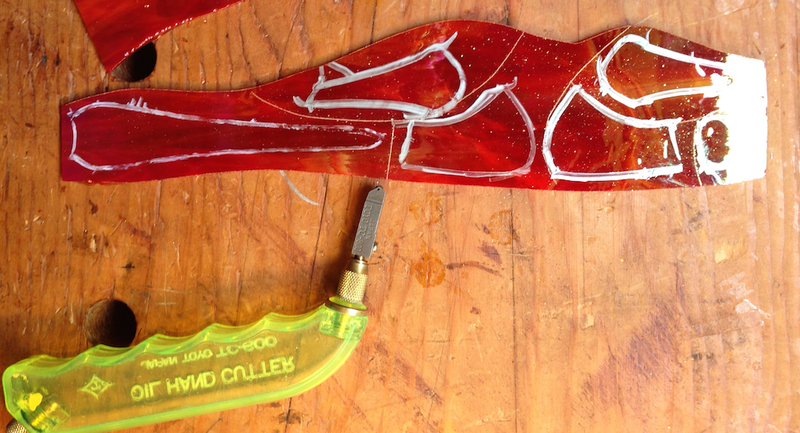 Rough cut dragonfly body. 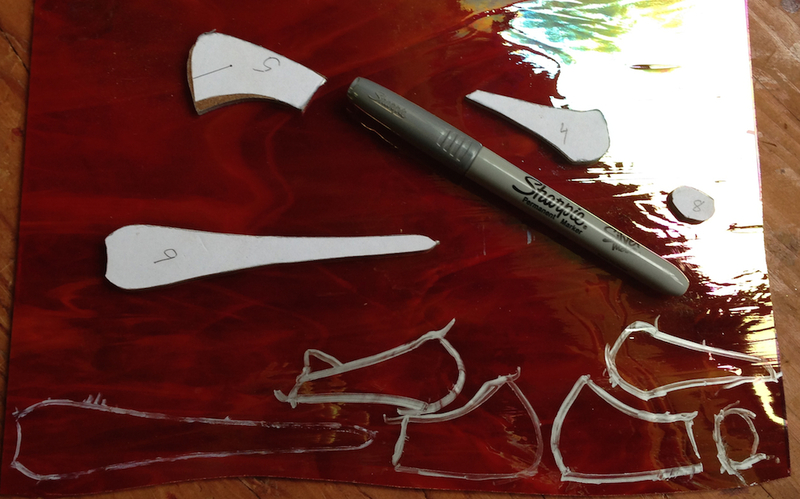 I need a finer sharpie, trying to score accurately to a 1/8″ wide layout line is a losing proposition! 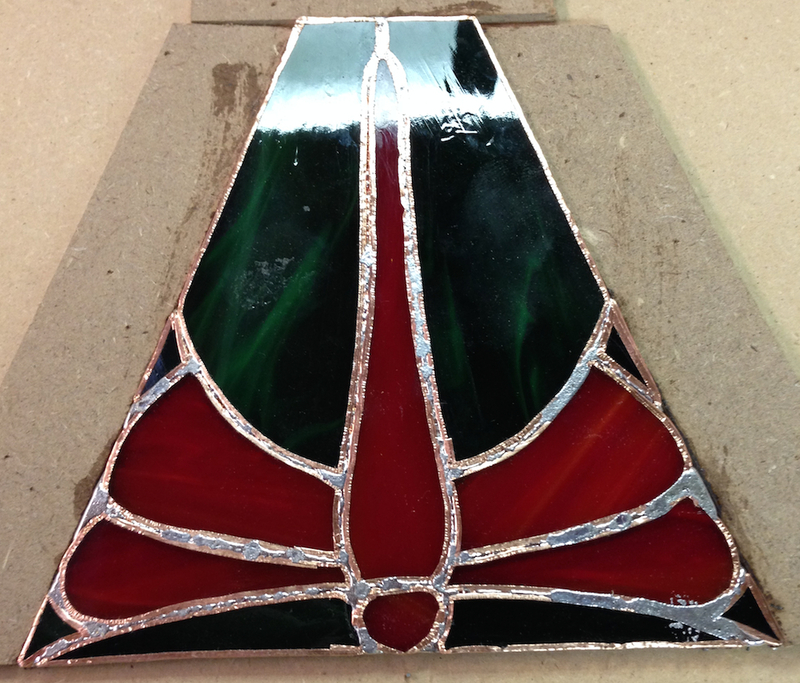 The finished test panel came out OK. I didn’t patina the solder seams yet (which always make a huge improvement) as I need to solder it to three others to make a shade first. The seams are a little fatter than I want, but once it’s all finished it should look good. I need to get cracking on these and get them finished! 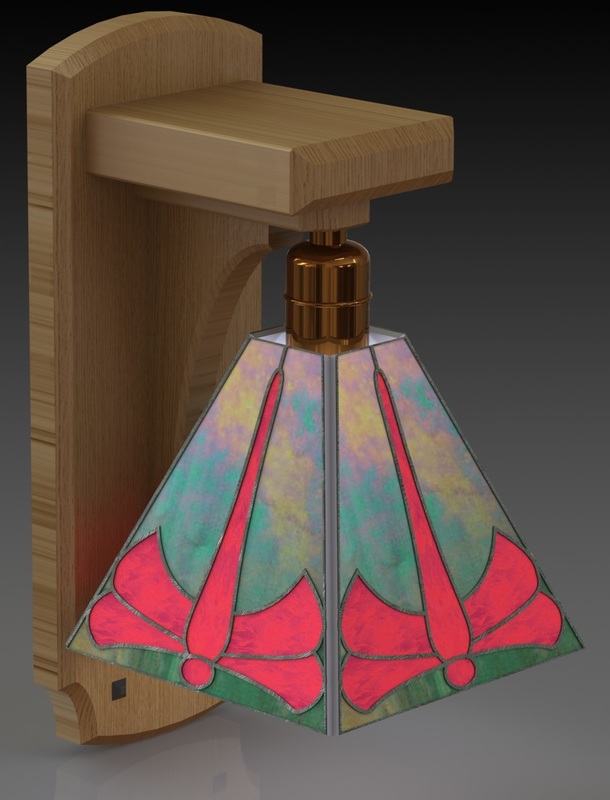 After I hung the cabinet I made for the guest room I was eager to get on to building a pair of the Dragonfly sconces I designed (plans are available for downloading here). 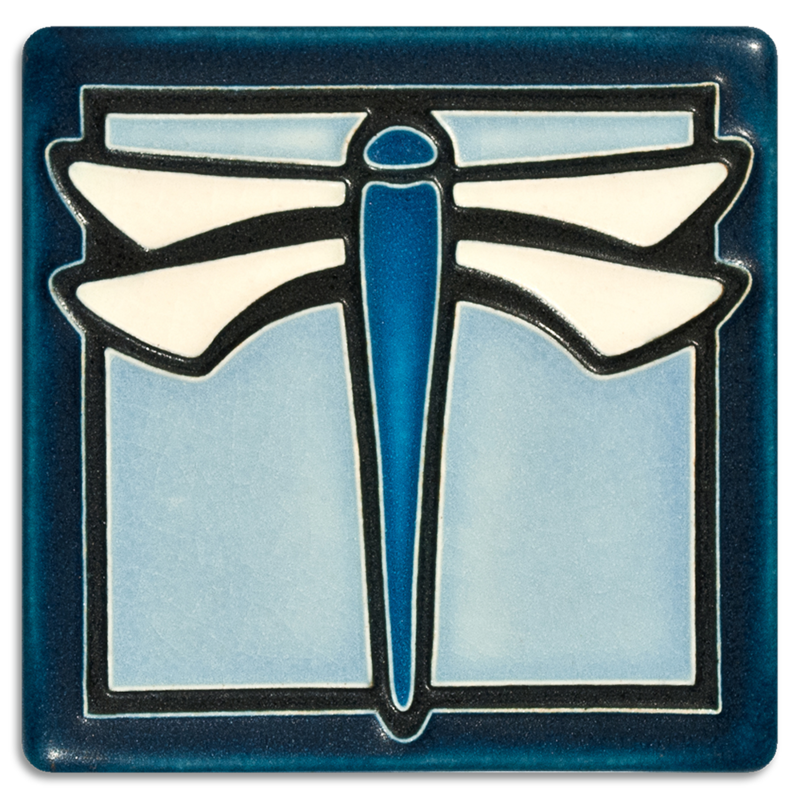 As a quick recap, this is inspired by a Dard Hunter stylized dragonfly design that was used in a tile and other items. 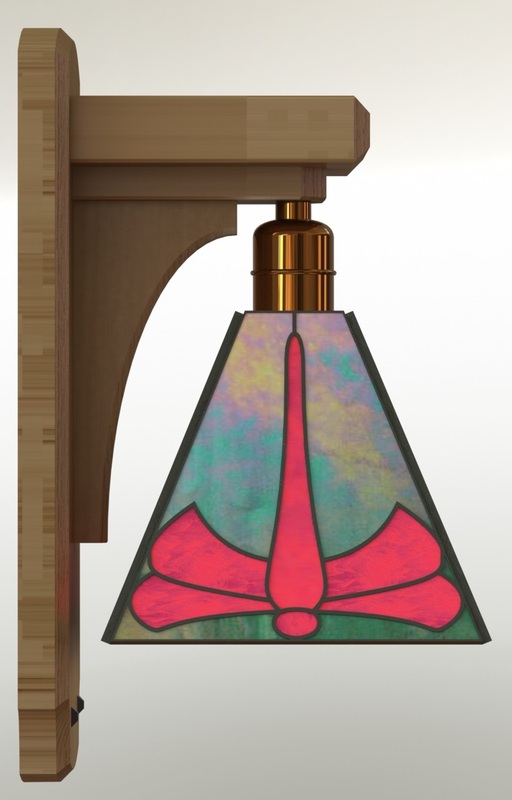 I came across this and thought it might make a cool stained glass design — I was “shopping” for ideas for the glass panel for the Byrdcliffe-ish cabinet. Anyway, this is the design I came up with. It’s relatively simple, although given how slow I seem to be at completing projects I wasn’t sure how long it would take. I deeded to keep track of my hours to get a better feel for this. When I used to build chopper parts and had to do the same thing over and over I kept track of how long everything took me so I could plan my time. It got to be something of a race and I eventually got really fast at each operation. 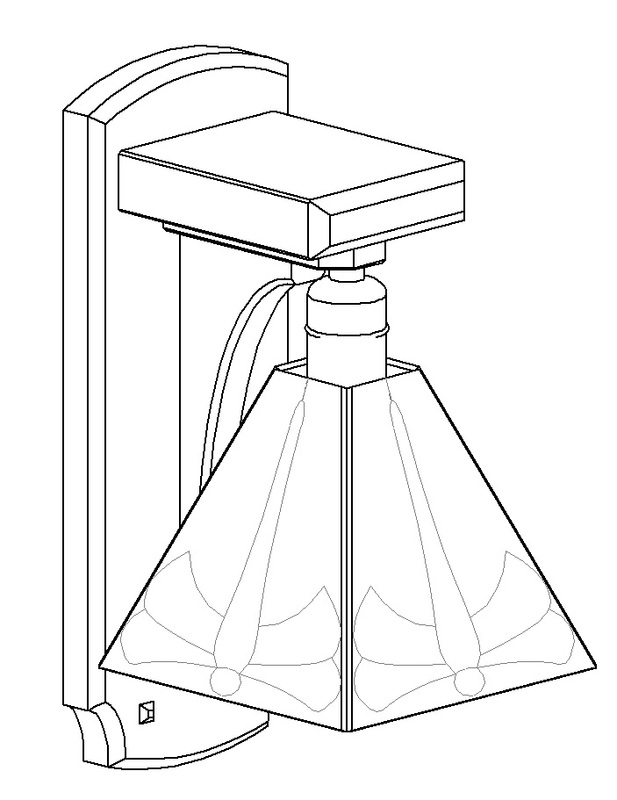 To get started on building the sconce I printed out the plans I made, full size on 11×17 paper at Kinkos. 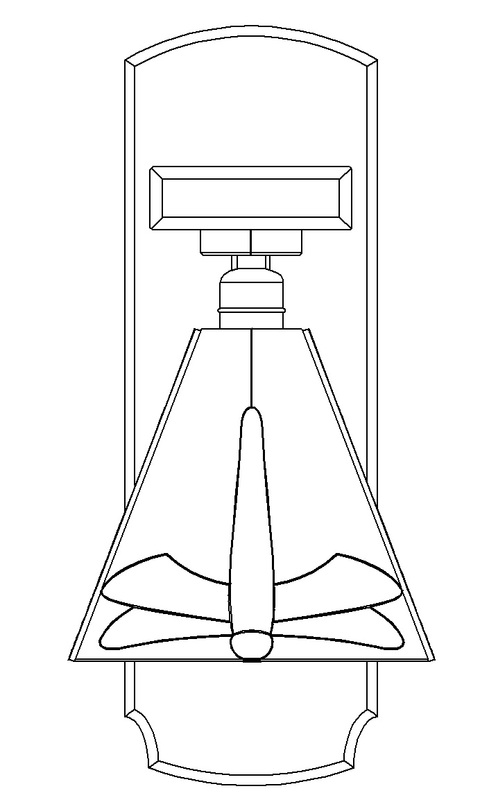 (Hint: if you do this Adobe Acrobat will try to “scale to fit” the plans, make sure you print them at 100%). 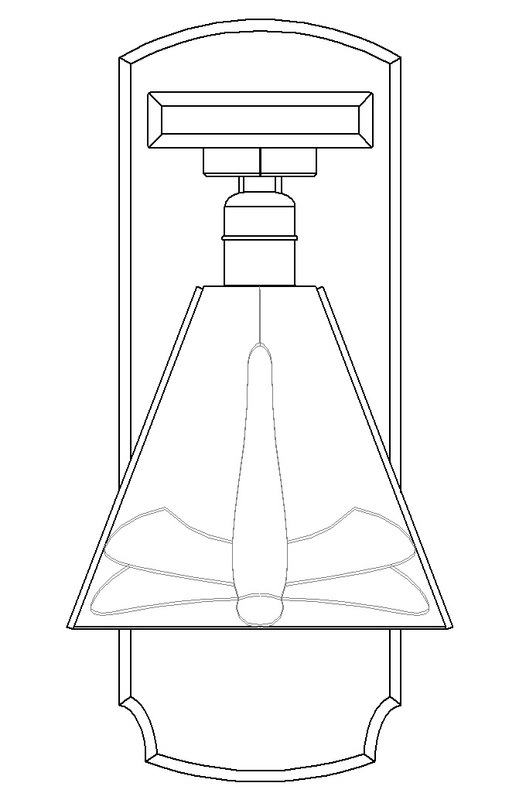 I cut out the full scale layout for the shade, wall mount and corbel so I could make some patterns. I used some spray adhesive to glue the patterns to some .060″ thick aluminum sheet. I guess thin MDF or even thick poster board would work too. 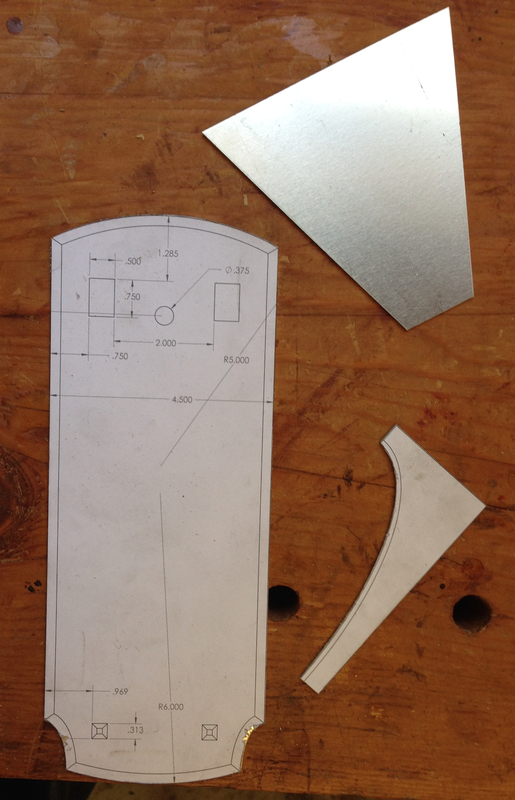 I trimmed the aluminum to the layout lines and I had my templates. 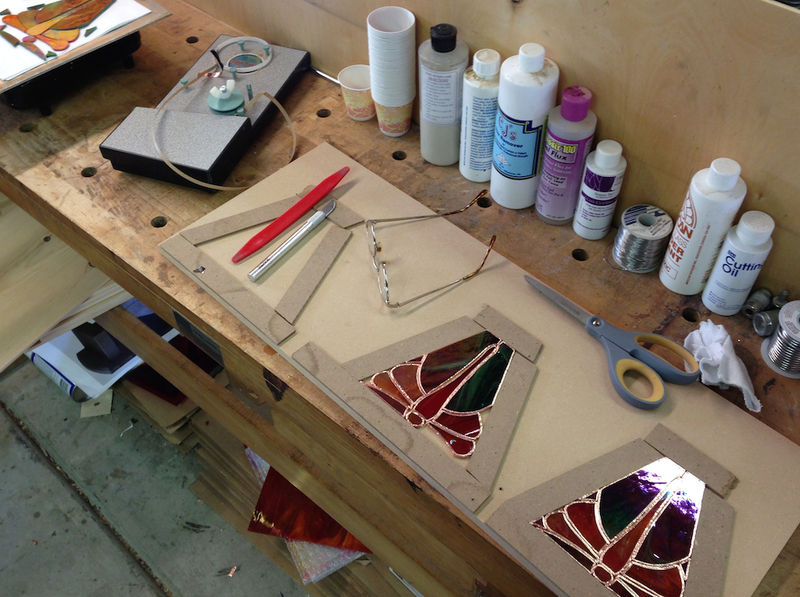 I used the pattern for the shade to set up the pattern board for the stained glass shades. I made sure it was exactly symmetrical. As long as each assembled panel fits into the pattern board they should end up even when I solder four of the together. 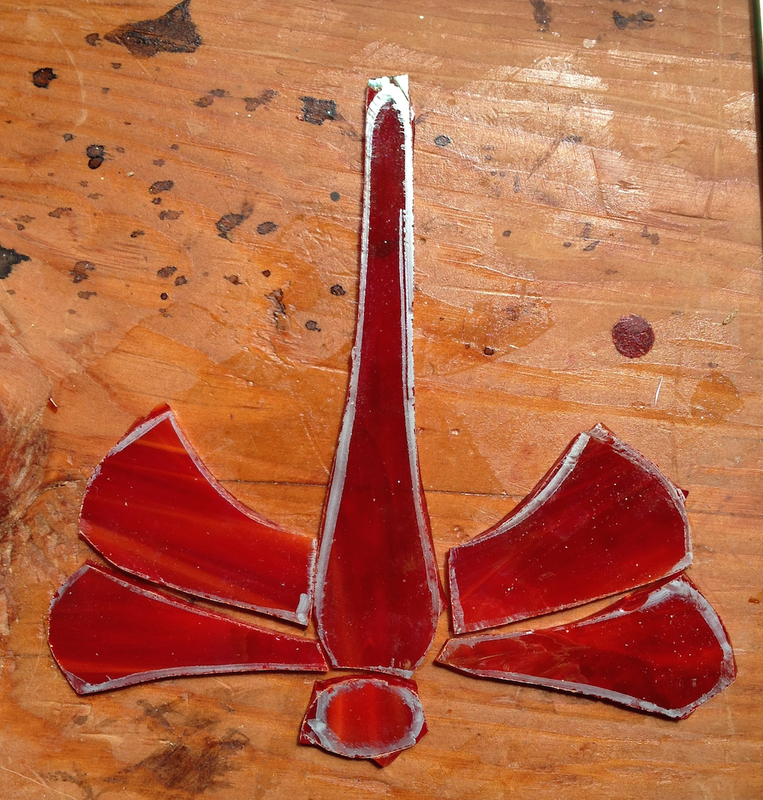 I set this aside for now, hopefully I’ll be able to get to the glasswork next weekend. 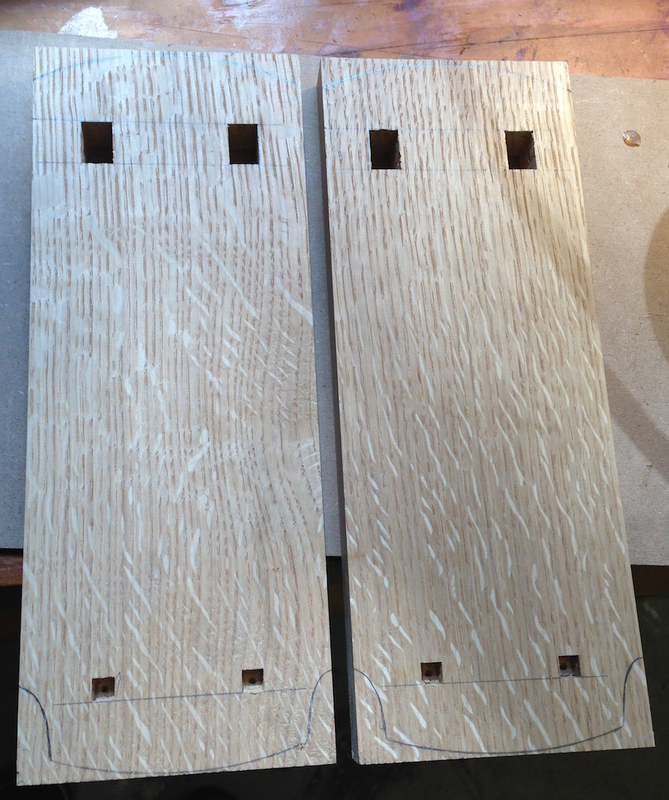 I machined all of my stock (more Quartersawn White Oak) to thickness and rough dimensions. Then I used the patterns for the wall plate and corbel to lay out the details. 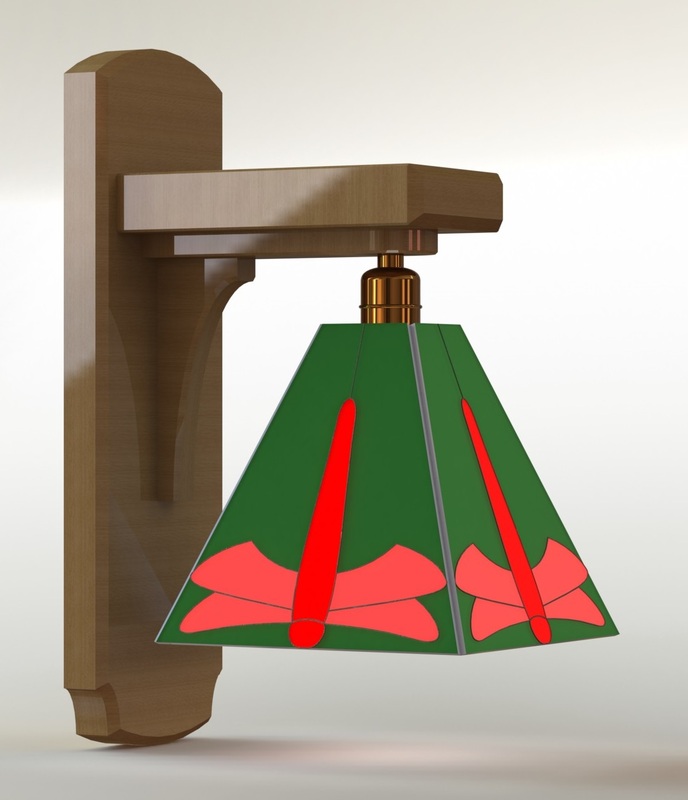 I wanted to get everything done to the wall bracket I possibly could before I cut the profile shape on the ends. 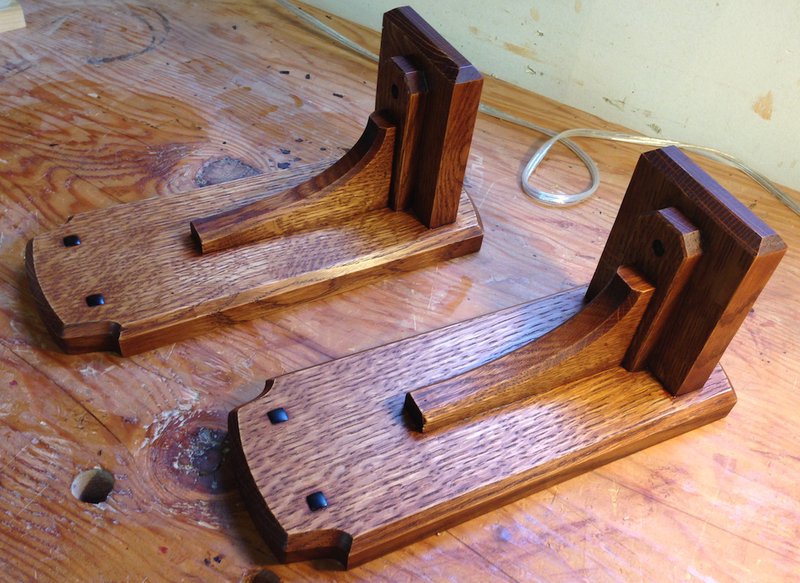 I did the through mortises for the support arm and the square holes for the 5/16 ebony plugs first. Then I routed recesses in the back for the keyhole hangers, drilled the wire hole and routed a clearance slot in the back for wires. 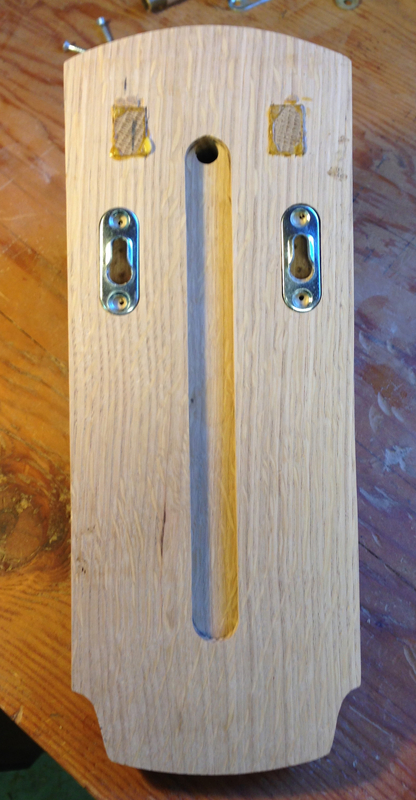 I made the tenons on the horizontal brackets next. 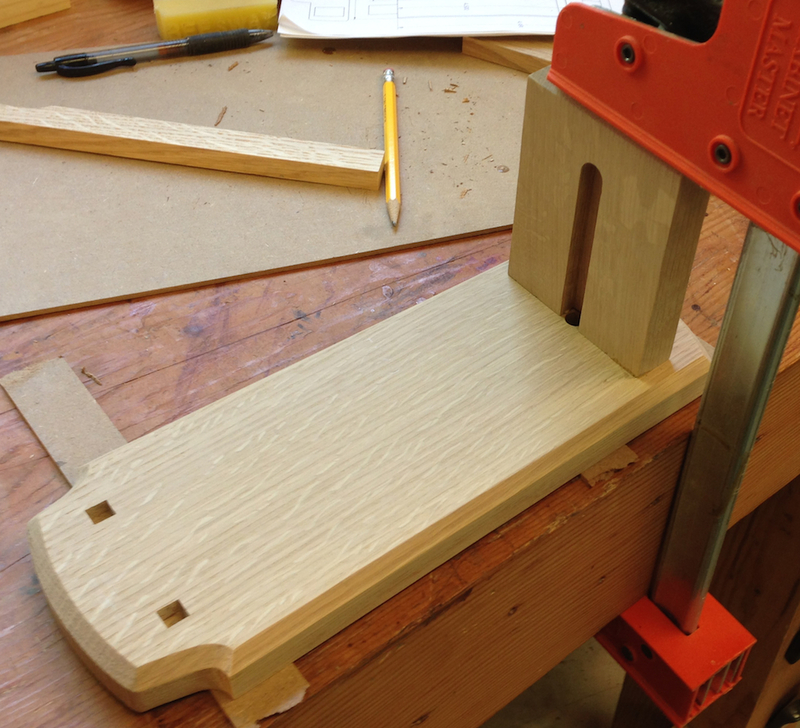 I used my tablesaw with a dado blade to cut the outside shoulders – leaving me with one wide tenon the correct height and as wide as the outer edges of the mortises. 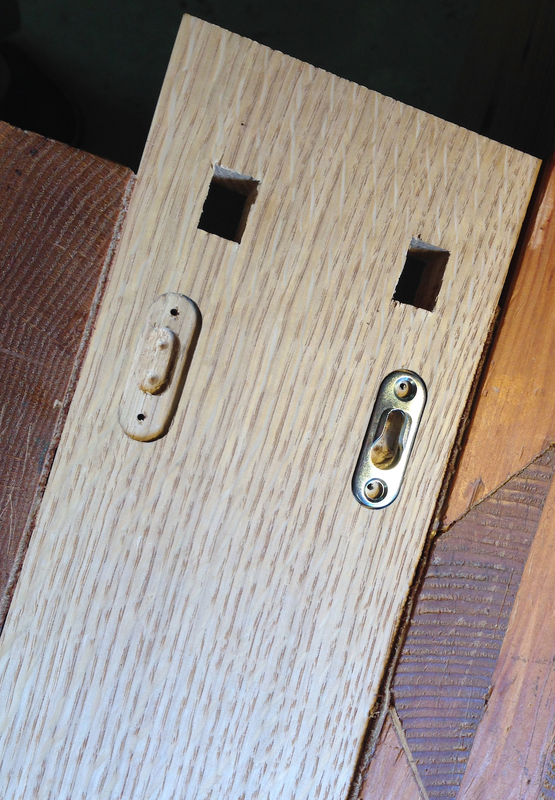 Then I knifed in the inside walls of the tenons, transferring them from the mortises and used my tenon say to cut the inside fact and chopped out the waste. I got a decent fit after some fine tuning with a chisel. 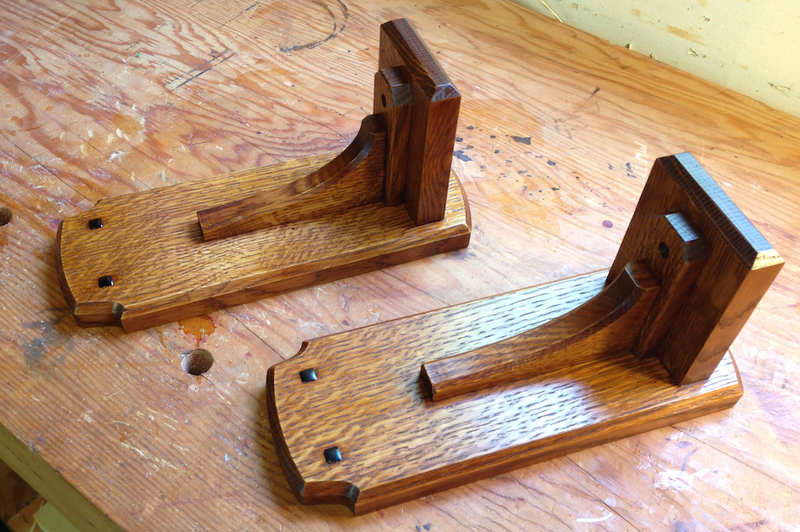 Once I was satisfied with the mortise and tenon joint I routed a wire groove in the support arm, transferred the location to the wall bracket and drilled a through hole and was finally ready to cut out the profile on the wall plates. 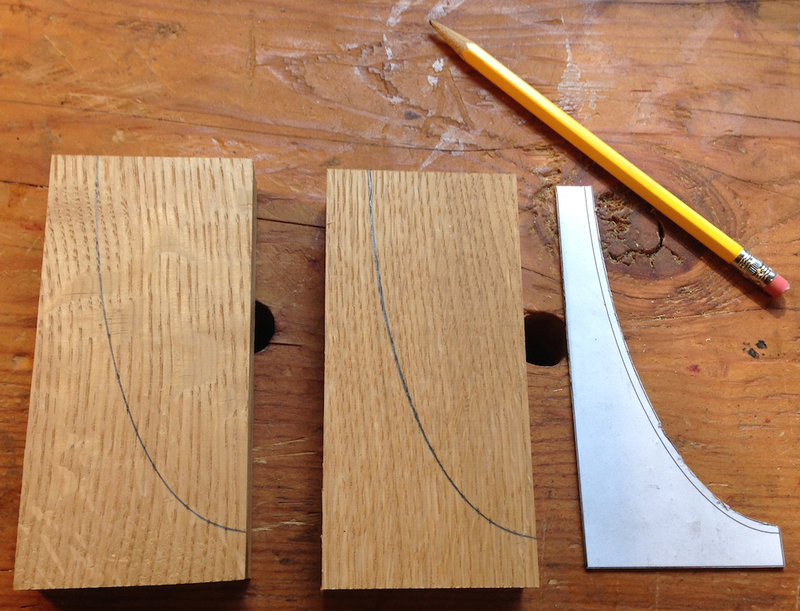 I sawed as close to the line as I could, then cleaned up the shape with rasps and sandpaper. Before I knew it I was gluing up the brackets and it was only 2:30 in the afternoon. I took a break, ate lunch, fixed a clogged drain and went back out to the shop. 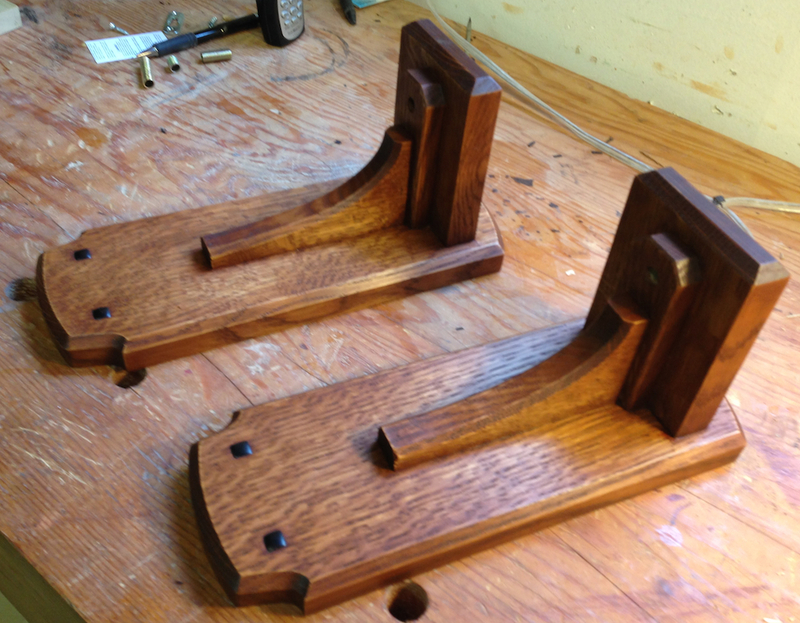 Making the corbels and the cover plate for the wire groove was simple stuff. I drilled and tapped the hole in the cover plate to 3/8-27 to match the size of the 1/8 IPS threaded tube used in lamp parts. 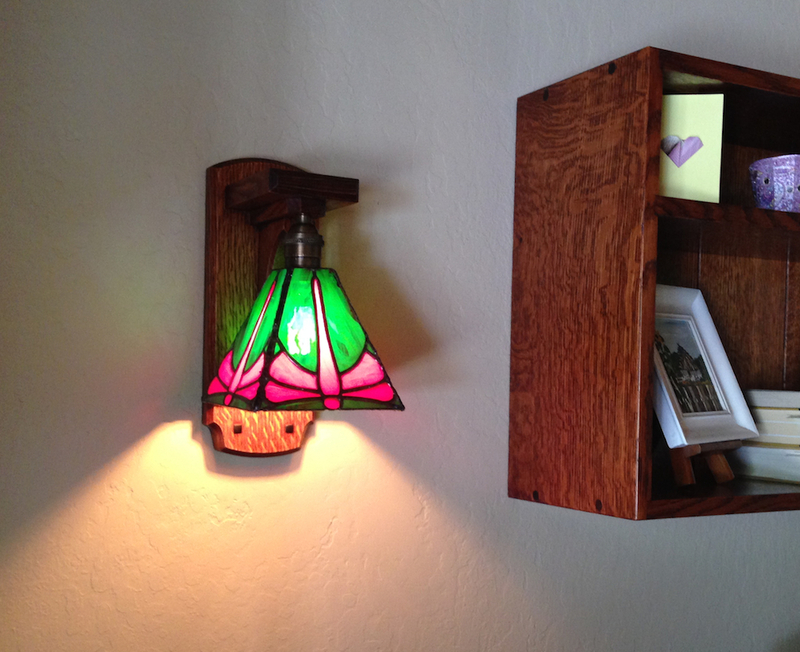 I glued and pin nailed these parts in place and suddenly I was done with both sconce bodies. Wow, that went pretty quick. I have to make the ebony plugs and put some finish on these, but it’s mostly making the shades now.